As those of us living in North America know, many of Audi's most powerful models never reach our shores. This may be about to change. Thanks to Canadian MTM distributor Horchaus, models such as the Audi RS6 Avant, RS6 Sedan and B7 RS4 Avant could finally be able to run wild on North American streets. In addition to the previously mentioned cars, the company is also looking import the Audi S3 and Audi TT-RS. 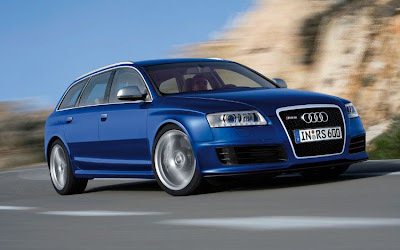 As Horchaus notes, the Audi RS6 is just too good of a car to leave in Europe; "We, at horchaus, believe that the RS6 is too much of an incredible vehicle to prevent North America from enjoying its brutal power. We are currently in a strategic position to import RS6s to the North American (i.e. Canadian and American) market." From what we understand, Horchaus' pricing on the Audi RS6 Avant is set at about C$115,000, or US$108,000 (which is a great price compared the RS6's European price tag of €110,650). We have 2 more RS6s coming: 1 Blue Sedan and 1 Grey Avant. In the same shipment, we imported 1 White R8 V10 and 1 Bright Orange RS4 Avant. Those 2 are already sold to customers. We can also import any other type of vehicles: S3, RS4s (Avant or Cabriolet), R8s, Q7 TDI, etc. Just tell us what you want and we will get it for you at a very reasonable price."